The HHR200-2 Henry Hound is getting rare as Numatic don't seem to be making them any more. If you think you might want one, read on otherwise consider the Henry Xtra. Henry Hound was a top of the range dry only vacuum cleaner with a powerful 1100W two stage motor providing high and low ("Hi" and "Lo") 2-speed operation. Henry Hound has a 10m cable with an easy to use rewind system. It has a giant Odourtex filtration system and Microflo dust bags. This model also incorporates Numatic's unique 24 volt safety specification electric power brush system to provide fast and efficient carpet care. Of special note is the fact that Henry Hound is a very quiet hound (for a vacuum cleaner) and so is ideal for areas where noise can be a problem. You should also review the newer Henry Turbo vacuum cleaner before making your buying decision. When buying a Henry Hound you want to make sure you find a good supplier. Online it can be difficult to know which suppliers you can trust but I have found, to my surprise, that Amazon sell other things beside as books. What's more they have some of the best vacuum cleaner prices and provide the security of buying from a well known and trusted brand. So I have included a Henry Hound product link to Amazon on this site which displays their current price. And remember, with Amazon delivery is included in the price shown. 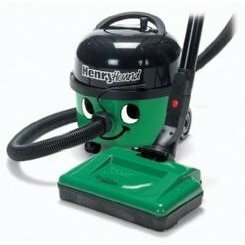 Simply click on the link to purchase your very own Henry Hound Vacuum Cleaner.